I love the serendipitous pleasure of coming across a cookbook that I’ve never heard of, one that grabs me and pulls me in. Such is the case with The Soup Club Cookbook by Courtney Allison, Tina Carr, Caroline Laskow, and Julie Peacock. 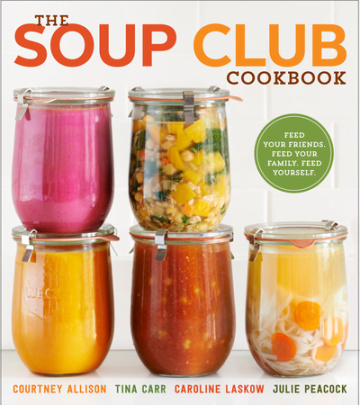 From the cover depicting Weck canning jars filled with soup, to the explanation of what’s a Soup Club and how to start one, to the recipes inside, there so much to love about this book. The authors, four friends and neighbors in New York City, formed a Soup Club, an ingenious idea where they each take turns making and delivering soup to the others. This idea allows them to share their love of food and cooking. For the cook of the week, it gives her the pleasure of sharing food from her own kitchen, and for the others, they can count on enjoying a home-cooked meal with minimal effort. The authors lay out the basics for novices, like how to stock your pantry and how to make assorted homemade broths to serve as the foundation for the other recipes. Even an experienced cook will learn things. The tips on cooking large quantities of soup are helpful reminders as well. In addition to recipes for simple vegetable, fish, beef, and chicken broths, you’ll find a variety of innovative soup toppers to try. At the top of my list are the Grilled Cheese Croutons and flavored Crème Fraîche. Coming from four different home cooks with different backgrounds and tastes, the recipes cover a wide range of flavor profiles. The soups are grouped into sections based on the style of soup. The first group of recipes is for “Soups of Assembly” which start with broth and transform to a meal with the addition of other ingredients to create a “composed” soup, such as “faux” ramen and pho. Moving along to bean soups, you’ll find new (to me) variations on the standards of split pea (green or yellow), lentil, and black bean soups. I’m looking forward to trying the Spanish Chickpea and Spinach Soup. If you prefer smooth, pureed soups, the “Purees” section offer recipes using whatever vegetables happen to be in season. I’m glad it’s almost spring because the Roasted Asparagus Soup looks especially good. Hearty soups are chunkier. Recipes cover the agricultural cycle, from a creamless winter corn chowder to a summery zucchini soup with salsa flavors. The Senegalese Peanut Soup is the recipe that most intrigues me from this section. Summer seems a little closer when browsing the recipes for “Chilled” soups. For now, I’ll have to just imagine enjoying a refreshing bowl of Gazpacho (tomato, green, or watermelon). The book includes a handful of “Fish” soups, most notably a Thai Fish Curry. While most of the book leans towards vegetarian recipes, it is not a vegetarian cookbook. A section of “Meat” soups will satisfy the carnivores in your household with a bowl of comfort. The Filipino Healing Soup, with a full pound of ginger, is marked with a bookmark. Each soup recipe includes suggested tips on how to package for delivery and finishing instructions for the recipient. Most of the recipes include accompanying garnishes to be added at serving time, and a few require some additions for ingredients that are best added at the last minute. The spirit of the book wants you to share your soup, but the recipes can be reduced for single household quantities. I successfully quartered the Sun-Dried Tomato Soup, using oven-dried tomatoes and chopped basil that I’d stashed in the freezer over the summer. As a bonus, the back half of the book gives recipes for soup accompaniments including salads and salad dressings, breads, snacks, side dishes, and even a few main dishes. As with the soup recipes, the collection of non-soup recipes make shareable quantities, so also lend themselves to casual party or potluck fare. All of the recipes are straightforward, yet interesting. In many cases, variations are suggested so you can make the recipe your own. The different authors’ voices intertwine in the recipe headers and margin notes as the four friends talk about their recipes, their cooking strategies, and the Soup Club. Their commentary makes me want to be their friend, hanging out with them, eating, cooking, and just talking about food. In addition to the engaging text and appetizing photos, the hand-drawn illustrations made me smile. If you already like soup or want to be motivated to make more of it, this book is for you. if you belong to a CSA with its steady supply of fresh seasonal vegetables, this book will help you answer the question of what to do with “all of that…” — you fill in the blank. I can honestly say that, with exception of one recipe that contains shredded coconut (which I could omit), every recipe in the book appeals to me and is something I would possibly make for myself. I’ll let the seasons be my guide as I continue to sample the recipes in this book, using the freshest ingredients as their harvest time cycles by. The Cottage Cooking Club is halfway through their journey of cooking through Hugh Fearnley-Whittingstall’s cookbook, River Cottage Veg. To mark the milestone, our fearless leader Andrea of The Kitchen Lioness declared March a makeup month. 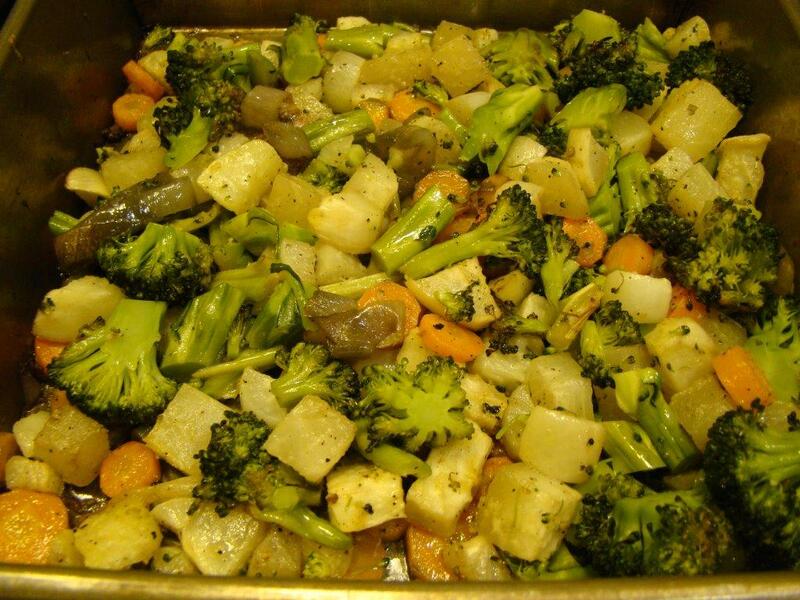 As a farewell to winter and storage vegetables, I chose a couple of recipes that looked very appealing when my colleagues made them during the cool-weather months. 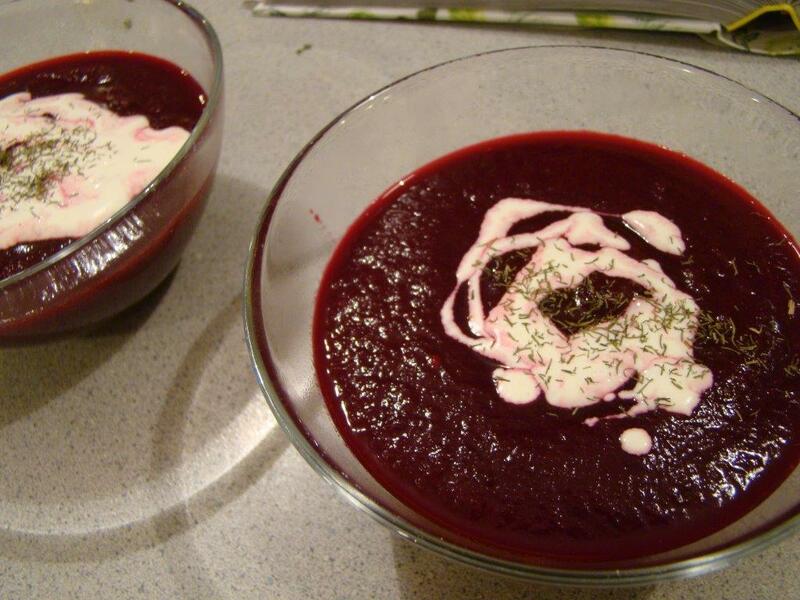 First, I made Roasted beet soup with horseradish cream which was in the lineup last month. Beets are one of my favorite vegetable. I never ate them until I was an adult, but once we were introduced, the love affair never stopped. 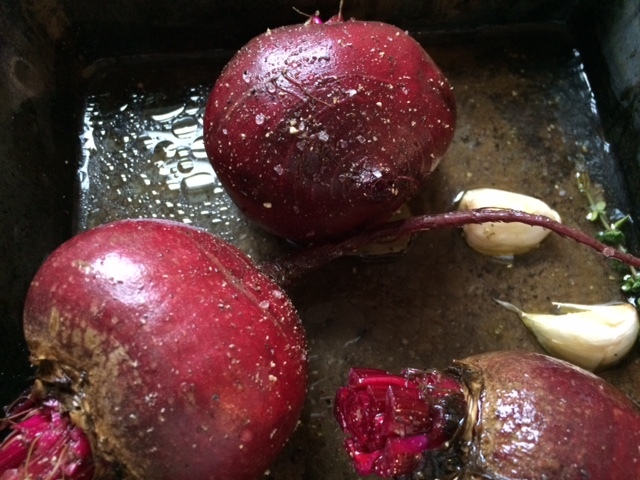 I nearly always roast them, which makes them extra sweet, and I was excited to learn a new trick for roasting beets with this recipe. A few crushed garlic cloves, sprigs of thyme, and a bay leaf are added to the roasting pan and everything is tossed with olive oil and seasoned with salt and pepper before covering the pan to go in the oven. I didn’t expect it to make much of a difference from my usual method (which is to just roast the beets plain), but let me tell you, the house smelled amazing while they cooked. Once cooked, cooled, and peeled, the soup practically makes itself. Coarsely chopped beets are processed in the blender with just enough stock to get a smooth puree. Then, more stock can be added to get the desired thickness. I left it on the thick side, adding only about half the liquid called for. Howard was very excited that we were starting our meal with “borscht”. Even though he looked up and read me the definition of borscht from Wikipedia, I’m not sure this simple soup fits the definition. Regardless, with very few ingredients, this soup tasted of pure beet. All it needed was a dollop of crème fraîche mixed with horseradish and a sprinkle of dill for a gorgeous starter. We loved it. I still had a few random root vegetables from my farm shares languishing in the vegetable drawer since fall. With winter officially over, it seemed time to use them up and get ready for greener times. 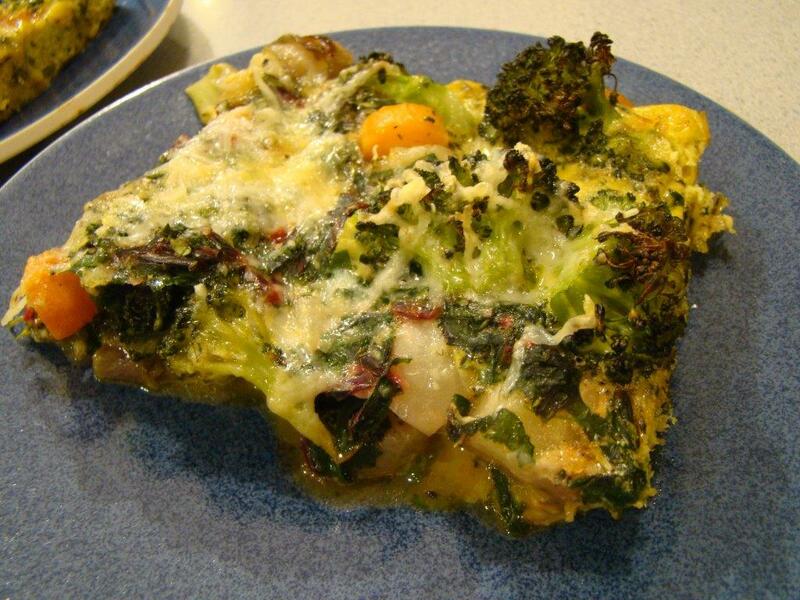 The Oven-roasted roots frittata that the group made back in September was the perfect vehicle. I chopped a daikon radish, a kohlrabi bulb, and some carrots, then added a sliced shallot and roasted them until they caramelized. Before adding the eggs, I added some leftover roasted broccoli. I also steamed and chopped the beet greens from the soup beets and added them to the mix along with thyme and rosemary. Topped with some grated gruyere, the frittata was ready to pop in the oven. Another success! I frequently make frittatas as a way to use up leftovers, but this recipe used a slightly different technique. I usually start it on the stovetop in a cast-iron skillet and finish it in the oven. Howard thinks the edges get too browned and take away from the dish. Cooking it entirely in the oven, as this recipe does, in a square pan, yielded an easier and more attractive result. This will be my new go-to technique! The only adjustment is added cooking time. Though it appeared the eggs were set, when I cut slices to serve, the middle was still a little runny. We were eating the outer pieces, so it was fine. For next time, I will raise the oven temperature, or it bake it longer, more like 30 minutes. To see what the other members of the Cottage Cooking Club chose to make this month, check out their links here. It’s March 28 and snowing outside. 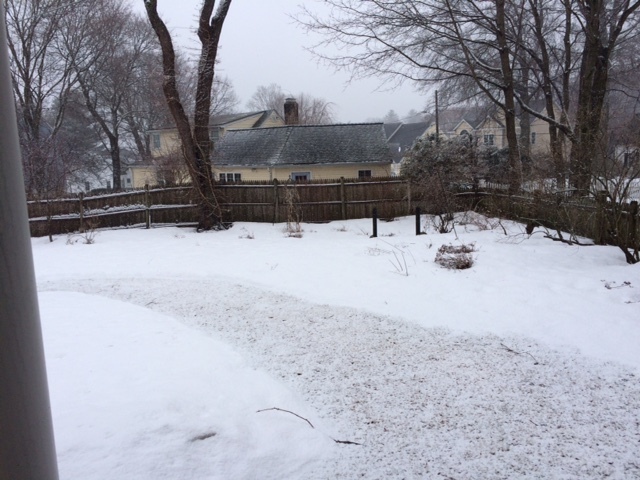 I know it won’t stick around long but, please, bring on springtime!!!! !